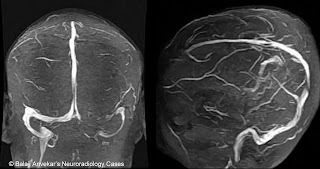 Hypoplasia and aplasia of left or right transverse – sigmoid sinus is a common finding where one sided lateral sinus i e transverse sigmoid sinus show poor flow related signals on 2D MR Venogram due to hypoplasia or no flow related signal at all due to aplasia – a normal anatomical variation. Most of the time it is very obvious considering clinical history, left side prevalence of this normal anatomical variation, normal adjacent brain parenchyma and signal characteristic in the region of sinus. But some times its really confusing for new comers and even for experienced eyes; for example if pt comes with history of ipsilateral hemicranial headache, history of trauma and study shows ipsilateral cortical haemorrhage which can represent a contusion or venous infarct. Points which can help you out..
1. Side prevalence: Hypoplasia and aplasia are more common on left side compared to right. 2. 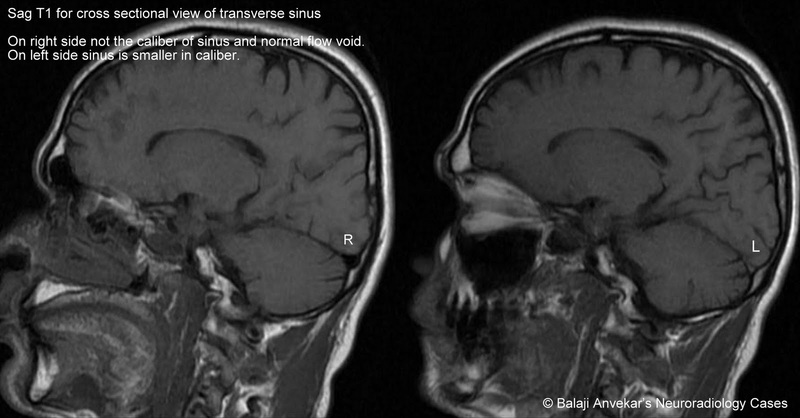 Calibre of sinus: viewing sinus on cross sections for example sagittal sections for transverse sigmoid sinus, sinus with hypoplasia / aplasia will be smaller in calibre. 3. Signals : No abnormal high signal in the region of sinus on T2 and Flair. A thrombosed sinus will be bulky with abnormal T2 high signal instead of normal T2 flow void. 4. Territory of sinus: if its a venous infarct it should be on the side, in the territory of concerned sinus and adjacent to the sinus. 5. Post contrast study: In case of hypoplasia or aplsia of sinus , there will be no enhancement in the region of sinus or may see enhancement along the dural converging of sinus which is normal. Where as in case of thrombosed sinus the intra luminal thrombus will show profuse enhancement. 6. T1w images: sagittal T1 images can be used for this, a T1 brightness in the region of sinus can be attributed to meth Hb staining of thrombus seen in sub acute stage thrombosis and rules out hypoplasia and aplasia. 7. Jugular foramen: compare the diameter of jugular foramen. The jugular foramen on the side of hypoplastic sinus will be smaller in diameter being poorly developed compared to opposite side. MRI is sufficient, but CT bone window images are the best for this. Chronically thrombosed sinus.....is a real graveyard for radiologist !!! and only the review of previous MRI films and Reports can save you. So always insist for previous details if you are in doubt. 1. A chronically thrombosed sinus shows abnormal heterogeneous T2 high signals instead of normal T2 flow voids, high signal on FLAIR. 2. Sinus is often smaller on cross sectional imaging. 3. Eccentric punctate T2 flow voids in the region of sinus attributed to recanalised channels, which show poor flow related signals on MR Venogram. 4. Post contrast study may be needed in some cases to demonstrate the enhancing thrombus on cross sectional images of sinus like sagittal sections in case of lateral sinus, coronal and axial sections in case of superior sagittal sinus. Click here to see the case of Chronic sinus thrombosis.